Crowdfunding hit the mainstream in Canada in 2014 with a record campaign for wireless speaker The Core by Mass Fidelity raising $1.3 million to lead the way. This raise was 60 per cent higher than the $817,000 raised for the top 2013 campaign for the magnetic Polar Pen/stylus in 2013. Donation campaigns supported many more causes and individuals than ever before. Equity and Lending models both gained traction with the promise of much more funding access to come. What will the New Year hold for alternative finance and crowdfunding in Canada? Here is a quick look back at 2014 and some fearless crystal ball gazing from advisors and ambassadors of the National Crowdfunding Association (NCFA) of Canada as we look to the coming year. For more on predictions for the past year, visit the post, see how well I predicted Crowdfunding in Canada for 2014. What was your favourite Canadian campaign of 2014? This question generated a mix of responses spanning entrepreneurs to causes from the top grossing campaigns of the year including the VanHawks Valor smartbike ($820,000) on Kickstarter and the Plexidrone photography drone ($1.2 million) on Indiegogo to several campaigns for the family of fallen soldier Nathan Cirillo ($400,000 plus), the first cross-border equity campaign for WAFU dressings and mayo to a new Opera for schools adaptation with an anti-bullying rallying cry, Stickboy for Vancouver Opera, by Black Press 4 Good. What was your favourite international campaign of 2014? Two of the most-covered Kickstarter campaigns also captured the attention of the experts: The Coolest Cooler and Potato Salad. Sunny Shao (@explicitivity), NCFA advisor pointed out, “Coolest Cooler was such a simple yet innovative concept and Potato Salad because it was just so dumb yet got everyone talking about crowdfunding.” I have to admit I’m waiting for the delivery of my cooler in 2015 myself and the communications to backers have been excellent. Other favourites included the relaunch of Reading Rainbow, which aims to continue to promote literacy for digital natives and the disadvantaged. Its Kickstarter campaign was “well executed in all respects and found a way to connect to a whole new audience,” says Shahab Khan (@shahabkan). Bruno Rakotozafy of Seeding Factory (@seedingfactory) offered up French platform Wiseed’s campaign, Rachetonslaeroportdetoulouse, for citizen ownership as a testament to crowdfunding’s impact. 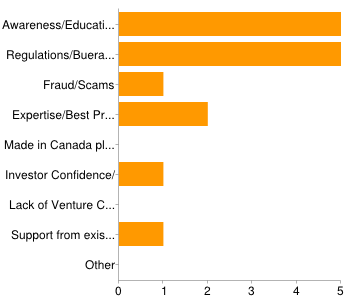 What stood out to you/was significant about Canadian crowdfunding in 2014? “The most significant thing about crowdfunding in Canada in 2014 is that it entered the mainstream with a significant component of the population starting or participating in crowdfunding campaigns,” Hatton says. Rakotozafy suggested the establishment of “the first Canadian Crowdfunding Summit” to be held March 2015 as a significant milestone. Other comments included the emergence of NCFA, greatly increased media coverage, new venture funding models and increased interest from the financial sector. Several comments pointed to the progression of legislation in various provinces but that homogeneity was unlikely from the securities regulators. Which model of crowdfunding will grow the fastest in Canada next year? Which model will grow fastest in 2015? The experts predicted a lending model for crowdfunding would see the fastest growth, based on its current small base and success in other markets. A rewards-based model (similar to Kickstarter campaigns) will be close behind, and equity taking longer to establish itself. “2015 will bring the finalization of Canadian equity crowdfunding regulations and the final implementation of the regulations for Title III of the JOBS Act by the US SEC,” said Michel-Garcia. What are the 2 biggest issue facing the Crowdfunding sector next year? The two biggest issues had wide agreement: 1) awareness/education/lack of market data and, 2) bureaucracy and regulations. Market maturity will help address the first issue. Let’s hope the regulators can strike the right balance to support the growth of venture capital and personal alternative finance while maintaining reasonable levels of investor, entrepreneur and creditor protection. 1. The equity crowdfunding market will continue to emerge but much more slowly than everyone wants. This is because the confluence of lack of market awareness, the difficulties of getting the model “right” and the wariness of the regulators in their goals of prevention of fraud will continue to great major friction in achieving adoption. 2. There will continue to be consolidation in the crowdfunding market with many small market entrants closing their doors. 3. Crowdfunding and cause marketing will continue to strengthen their relationship inviting much larger corporations to participate in the game and reaching many more consumers. This will shift the funding of many causes from “donations only” to a “give to get” model that rewards commercial behavior while supporting philanthropic activities. 2. Provincial securities regulators will continue to struggle to … create an appropriate equity crowdfunding business environment in their relative markets. Saskatchewan will continue to be a maverick and go with its own first-out-of-the-gate model. Anything else you would like to share with those interested in crowdfunding in Canada? There you have it. A look into the crystal ball at the year ahead from the Advisers and Ambassadors at the National Crowdfunding Association of Canada. Please leave a comment with your thoughts on what is ahead for 2015 alternative finance below. For more 2015 predictions by ITBusiness.ca bloggers visit our Technology Predictions post here.